He likes an occasional blow-out. 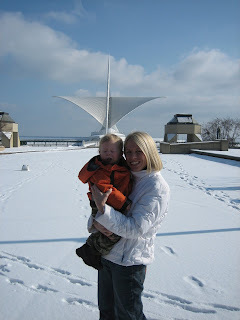 Outside the Calatrava on our way to the children's museum. Cy is light sensitive. Maybe he needs to get out more. 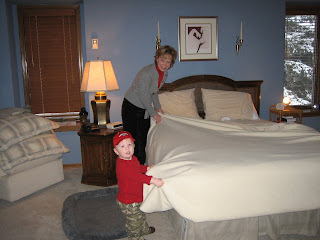 Helping Gma with their bed. The week has been flying by. Patrick came back up to Milw from Chicago last night. He was there all week for bizness. Tonight is...... Fish Fry night!!!! YUM!!! I am addicted to RYE bread with butter yum yum yum. Anyhoo, another great week in Wisco! 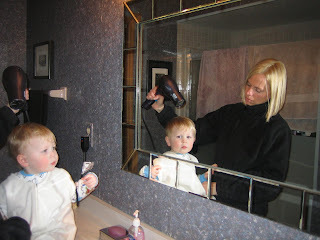 Family, friends, and a generous amount of mommy-time (thanks for the babysitting, grandparents) which included a day at the hair styler (her name is Shalin and she works at the downtown Erik of Norway and if you need a hairdresser, feel lucky I told you about her! She just came out of retirement -had 3 kids- and she used to be booked out for months in advance but she isn't yet!! Get in while you can!) Now, where was I.. oh yes, so I went to Shalin and she chopped & bleached my hair. I feel like I am wearing a wig. I really love it but it's quite different for me. Cy has been running around Brookfield acting like he owns the joint. Telling Grandma and Grandpa where to go, what he wants to do. Telling us when the dogs don't have enough water or there is a spot on his pants he doesn't like. I say "telling" but he isn't really talking yet. 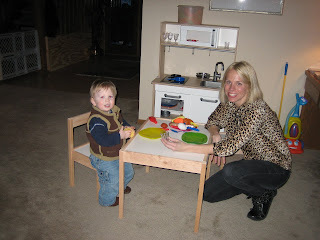 He has mastered the art of grunting, babbling, pointing and facial expressions. So much so that I find myself telling patrick stories of something funny Cy "said."